By Jason Gonzalez, Real Combat Media.com: Gennady Golovkin (36-0) took on Kell Brook (36-1) this Saturday at the O2 Arena in Greenwich, London. 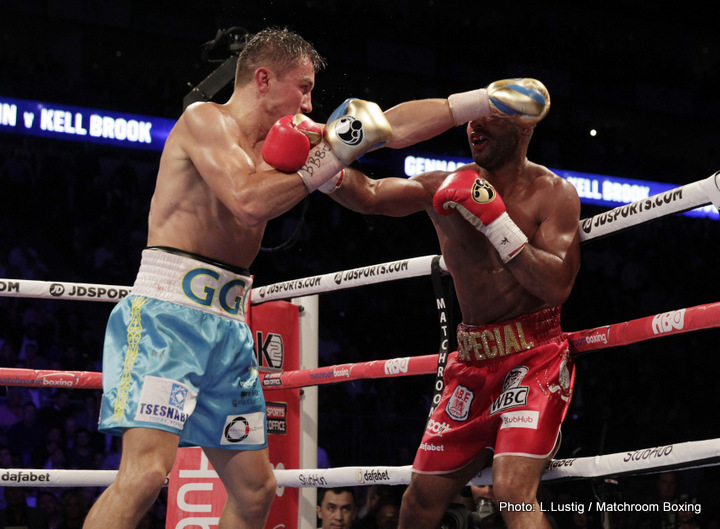 Golovkin won the fight by TKO in the fifth round after Brook’s corner decided that Brook had taken enough punishment. Leading up to the fight Golovkin was under major scrutiny for deciding to fight a guy who is two weight classes under him. Even though the fight did end early as many predicted boxing fans and critics learned at least one thing that night; Golovkin can be hurt. It was obvious from round one that Golovkin’s power was to much for Brook, but there was several times where Golovkin did look vulnerable. This is something that had not been seen before. Before this fight it looked like Golovkin was this invisible monster at Middleweight who would destroy Saul Canelo Álvarez. Now it seems as if Golovkin has a chink in his armor. One explanation to his questionable performance is the reports that Golovkin might have been sick going into the fight. Although these claims were denied by Golovkin and his camp, he sure looked drained it if you saw him at the weigh-in and even while entering the ring. Another thing that bothered some fans was the stoppage itself; some think the fight was stopped prematurely. But taking into account that Golovkin had broken Brook’s eye socket in the second round it was probably a good idea on the part of Brook’s team for protecting him. After seeing how Antonio Margarito’s eye ended up and even Israel Vasquez’s eye ended up it’s safe to say that Brook’s trainer made the right decision. As for Golovkin it looks like he was two decisions as of now, fight Daniel Jacobs or fight Billy Joe Saunders. Daniel Jacobs is Golovkins mandatory and they will be order to fight soon. This means if the negotiations do not go as planned the fight will go to purse bid. If for whatever reason Golovkin and Jacobs do not fight, Golovkin still has the option to fight Billy Joe Saunders who has expressed his interest in the fight. Across the world about three hours later Roman Chocolatito Gonzalez (46-0) took on Carlos Cuadras (35-1-1) at The Forum in Inglewood, California. Chocolatito is the WBC Champion at 112 lbs but he moved up to the division above at 115 lbs to challenge the WBC Champion at that weight which happened to be Cuadras. Chocolatito won the fight by unanimous decision but it was no where near easy; infact during the post fight interview Chocolatito said it was the toughest fight of his career. There was many times in the fight where the two fighters would go toe to toe, there was plenty of give and take. The difference was quantity versus quality. Cuadras would throw an abundant amount of punches and Chocolatito would throw sharp and stunning punches. Most rounds were difficult to score but the two fighters were neck in neck. The judges scored the bout unanimously for Chocolatito. 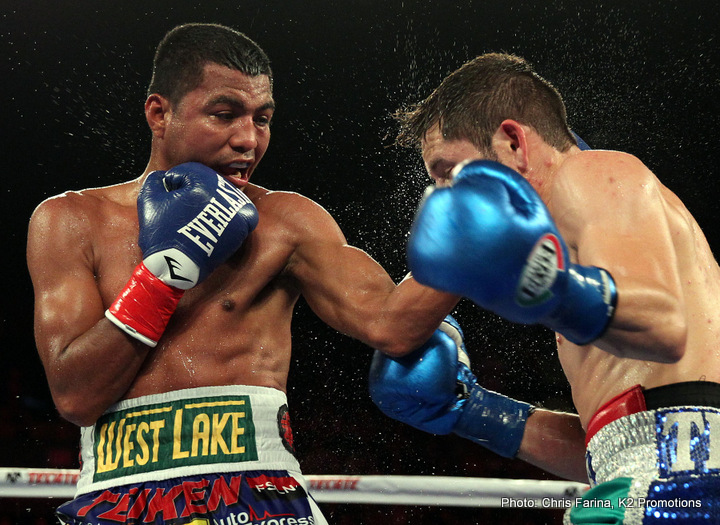 What’s next for Chocolatito you ask? During the fight the commentators mentioned a possible fight with WBO Junior Bantamweight Champion Naoya Inoue who happened to be in attendance. What if Chocolatito attempts to go up another weight division to fight for another WBC belt? On the undercard of Chocolatito’s fight was the rematch between Yoshihiro Kamegai and Jesus Soto Karass which ended up being a slug fest. Their last fight ended in a draw which prompted them to fight once again. The first fight was a war and the second fight was no different. These two fighters were slugging it out the whole fight but there was one difference; Kamegai was able to hurt Karass and Karass couldn’t return the favor. In the eighth round Karass was knocked down and wasn’t looking too enthusiastic to get up. After the eighth round Karass went to his corner and his coaches decided to stop the fight. Yoshihiro Kamegai won the fight by technical knockout and will most likely go on to fight more wars. As for Karass it looks like he will be retiring. Karass had mentioned that he was thinking about retirement before the fight so what better time than now? Please stay tuned every week for news and updates. If you have any questions that you want answered in the weekly report please email me at jasongonzalez@realcombatmedia.com or follow me on Twitter @boxingblaze or on Facebook at Jason Gonzalez. ABOUT REAL COMBAT MEDIA: Real Combat Media was founded in 2012. Since then realcombatmedia.com has become one of the most efficient premier international boxing and mixed martial arts online publications in the world. Our talented international team covers the latest combat news on a daily basis to provide the combat community with the best news in the industry for our readers. Our mission is to spread positive awareness of the combat sports to grow interest among the mainstream and to every region of the world. Next boxing news: Anger over Chris Eubank Junior’s “shameful” tweet!